We've been listening. The latest version of Skype for desktop includes your requested improvements. The latest version of Skype is faster to load, more reliable than ever and helps you get more done together with the people that matter most to you. 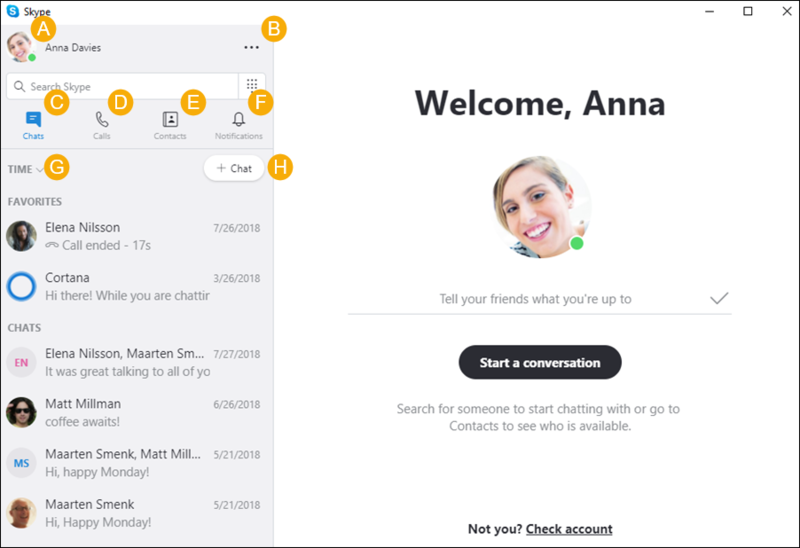 Skype (version 8) also includes features for a more personalized, interactive experience with your friends, family and coworkers. A. Profile - Access and personalize your settings. B. More - Access your settings, help and feedback, or sign out of Skype. C. Chats - Find your chats and favorites quickly. D. Calls - Make one-to-one or group calls or use the Dialpad to call a mobile or landline. E. Contacts - Find your contacts, view who's active, or invite people to Skype. F. Notifications - Catch up on reactions, and @mentions, or jump right back into a conversation. G. Sort Chats - Sort your chats by time sent or unread messages. H. New Chat - Start a new one-to-one, group, or private conversation. How to call, video call, call phone numbers and share my screen? Select Tools from the top tool bar. Select Export chat history from Skype. Double check to make sure that you are signed in to the new Skype application with the same Skype credentials that you use on classic Skype for desktop. Rich calling activities – Share your screen to enrich your time together with friends, family and coworkers. Call recording and Snapshots – Never miss a memory, important thought or decision. Skype now lets you record calls and capture still Snapshots during calls. Reactions - Easily express how you’re feeling by reacting to messages in conversations or during video calls. @mentions – Easily grab someone’s attention in a group chat, by typing the @ symbol followed by their name, this will trigger a notification to them. Notification panel – See all of the reactions to your messages, @mentions in group conversations and if someone has quoted you in a centralized place. Click on the bell icon next to your contacts and chats to launch the notifications panel. Share photos, videos, and other files – Share up to 300 MB at a time by dragging and dropping files into a conversation or selecting the type of file you’d like to send near the chat text box. Chat media gallery - Looking for that link sent to you a few weeks ago? Quickly find shared content in the chat gallery. Click Gallery to see media, links, and files - you can even sort by type. Conversation assistants – Start a conversation with a bot or add them to your conversations so they can help you do things like book tickets, plan a trip, search for news and more. Flexible group call canvas – You can customize your group call experience and decide who appears in the main call canvas. Simply drag and drop contacts between the main call view and the overflow ribbon to select who you want to focus on. We’re continually releasing updates to our application, based on customer feedback. Check out our Release Notes for the latest updates. As we continue to add improvements we want your suggestions and ideas. Provide feedback so we can work together to deliver new features and needs that you love.